Ben Mee was delighted to return with a clean sheet at Brighton after two games out. Mee had stitches to a wound above his knee following the 1-0 defeat at Leicester City, and saw his ever-presebt record come to an end. He sat out the 1-0 wins at home to Watford and Stoke City, but was back in the side and took over the armband from Jack Cork at the Amex Stadium. Mee said: “It’s nice to be back in, the lads did well when I wasn’t playing, with a couple of clean sheets, and it was another here, which was pleasing. “(Kevin)Longy did really well. I was glad to be back in the side after those wins. “We weren’t at our best here, but we dug in and ground out a result. “It was a good point for us and another clean sheet. 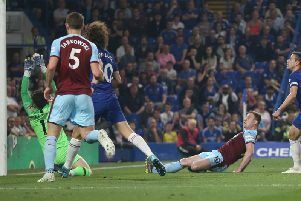 Burnley had to weather a first half storm from Brighton, who hit the post and missed a penalty, and Mee admitted: “They were really up for it and we found it tough in the first half to get anything together. “The crowd were up and it’s a tough place to come when the crowd are bouncing. Burnley only took seven points on the road last season, so might it have been a game they would have lost last year? : “Possibly, yeah. We didn’t have any luck away from home last season. “We’ve tightened up a lot away from home, we know it a bit better and we know how to control our emotions and our feelings a bit better.